The sixth generation of the 911 series’ top-of-the-range model will be celebrating its world premiere on February 28, 2006 at the Geneva Motor Show and will be available in German dealerships as from June 24, 2006. The 911 Turbo (Type 997) now has an output of 353 kW (480 bhp) at 6,000 revolutions per minute, 60 bhp more than its predecessor (Type 996). The specific output of the 3.6-litre boxer engine thus climbs to a new all-time high of 98 kW (133 bhp) per liter of displacement. Rated torque has been increased from 560 to 620 Newtonmeters. The speed range in which this power is available has also been extended. While the previous model’s maximum torque was available between 2,700 and 4,600 revolutions per minute, the corresponding figures are now 1,950 to 5,000 revs. These improvements are translated into driving performance. The new 911 Turbo with six-speed manual transmission requires 3.9 seconds for the standard sprint from zero to 100 km/h. The coupé reaches the 200 km/h mark in 12.8 seconds. And just 3.8 seconds are all it takes for the most powerful series-built 911 model of all time to accelerate from 80 to 120 km/h in fifth gear. Despite these enhanced performance statistics, Porsche developers succeeded in reducing average fuel consumption by one tenth to 12.8 liters per 100 kilometers. The 911 Turbo with the optionally available Tiptronic S automatic transmission puts in an even more impressive performance. An optimized setup gives the vehicle the wherewithal to power from zero to one hundred in just 3.7 seconds and to reach 200 km/h after a mere 12.2 seconds. The Turbo with automatic transmission also has the advantage when it comes to flexibility. In penultimate gear it accelerates from 80 auf 120 km/h in 3.5 seconds. Fuel consumption by the Tiptronic S variant is 0.3 liters lower than that of its predecessor: 13.6 liters in accordance with the EU standard. Both transmission variants have a top speed of 310 km/h. The vehicle’s flexibility can be enhanced even further with the optional ‘Sport Chrono Package Turbo’, available for the first time. Here the driver selects the sports button’ adjacent to the gear lever to activate a short-time “overboost” at full throttle. This increases boost pressure in the mid speed range by 0.2 bar for up to ten seconds; torque rises by 60 to 680 Newtonmeters. The time required by the 911 Turbo with manual transmission for intermediate acceleration from 80 to 120 km/h is reduced by 0.3 seconds to 3.5 seconds. These performance figures owe themselves to exhaust turbochargers with variable turbine geometry, featuring for the first time in a gasoline engine model. At the heart of this technology are adjustable guide blades, which direct the engine exhaust flow variably and precisely onto the turbine wheel of the exhaust turbocharger. The principle of variable turbine geometry unites the advantages of small and large exhaust turbochargers and leads to a discernable improvement in flexibility and acceleration, particularly at low speeds. To transfer the available power to the road, the new generation of the 911 Turbo features a redesigned all-wheel drive with an electronically controlled multi-disc clutch. Porsche Traction Management (PTM) ensures variable power distribution to the two driven axles. Depending on the driving conditions, the all-wheel electronics system constantly determine the optimal torque distribution to ensure the best-possible drive. In practice this translates as high agility on narrow country roads, outstanding traction in rain and snow and optimal active safety even at high speeds. These properties make the Porsche Traction Management system in the new 911 Turbo one of the most powerful and, at the same time, lightest all-wheel systems on the market. The new 911 Turbo’s driving performance is duly tempered by its brake system, which comprises monobloc fixed-caliper disc brakes with six pistons at the front axle and four at the rear. In comparison with the Type 996, the diameter of the internally ventilated and perforated brake discs at the front and rear wheels has been increased by 20 millimeters to 350 millimeters. As an option, Porsche is also offering its optimized ceramic brake system, PCCB (Porsche Ceramic Composite Brake). The advantages of this high-tech material mean a reduction of 17 kilograms compared to the standard brake system, excellent fading stability owing to consistent friction values and absolute corrosion resistance. The brakes now have a diameter of 380 millimeters at the front axle and 350 millimeters at the rear. A characteristic design feature of the new 911 Turbo is the modified front end with its distinctive, tautly drawn cooling air inlets. In conjunction with the standard-equipment oval bi-xenon headlights, they define its unmistakable image. The harmonious front view is enhanced by widely placed and deep-set fog lights and by new LED flashers, which are situated in the lateral air inlets of the front end. From the rear perspective too, the Turbo takes on a more powerful appearance. This is due first and foremost to its tail end, 22 millimeters wider than that of the previous model, to which the redesigned wing spoiler element has been aligned. It now slopes downward slightly at the sides to nestle into the contours of the rear fenders. The lateral air inlets behind the doors have also been redrawn and, together with the new air ducts, afford a more efficient supply of cooling air to the charge-air intercoolers. The basic Euro price for the 911 Turbo is 115,000 Euros. In Germany it is available for 133,603 Euros including value added tax and country-specific requirements. 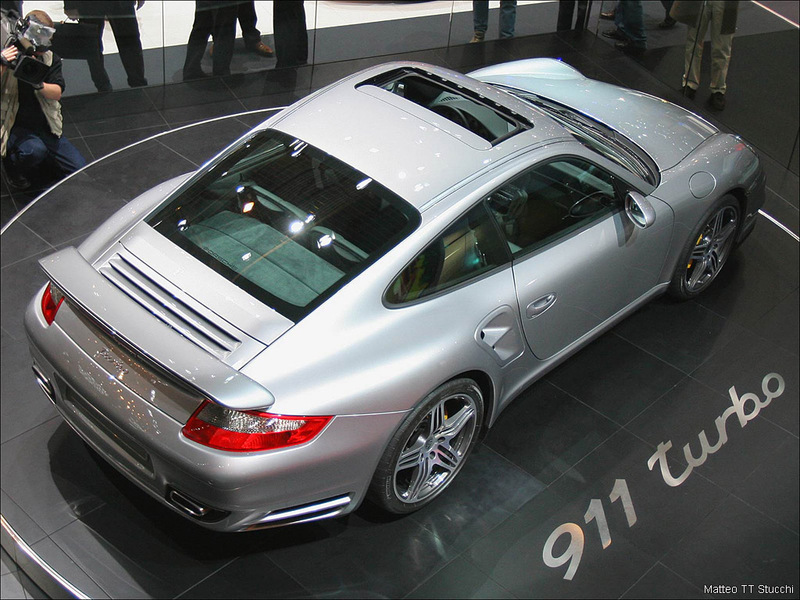 In the USA the 911 Turbo is priced at 122,900 Dollars (not including taxes), and will be available as from July 8, 2006. In addition to the 911 Turbo, as a special surprise at the Geneva Motor Show, Porsche will be presenting another world premiere: the new 911 GT3. You will receive technical data and photos of this “racing car for the road” on February 28, 2006, the first press day in Geneva.